JEFFERSON CITY, Mo. — Attorney General Josh Hawley has some thoughts on the hiring of taxpayer-funded attorneys to defend Governor Eric Greitens’ Office in impeachment proceedings. In simpler terms, the office is not authorized to hire private legal counsel without permission from the Attorney General. Greitens’ office has enlisted the services of two attorneys, Ross Garber and Eddie Greim, who are being paid a combined total of $660 per hour. Hawley’s letter says that no authority exists for the Governor’s office to retain those attorneys, and said that furthermore, the impeachment and removal of a governor does not “impinge on the power of the Office of the Governor,” but instead affects the individual wielding those powers. “By all appearances, the private impeachment counsel seems focused on advancing the individual interests of Governor Greitens rather than the institutional interests of Office of the Governor,” he wrote. “It appears that the private counsel … are simply advancing the private interests of the individual who happens to currently occupy that Office. 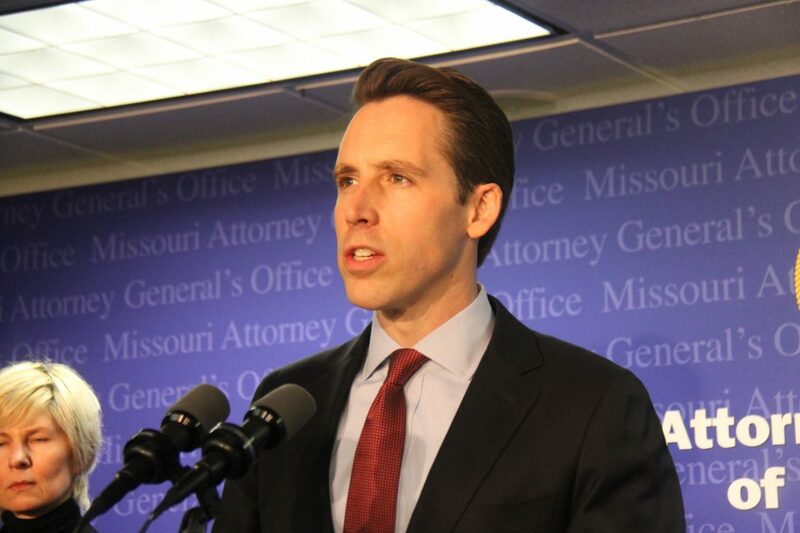 “I ask that your ongoing review consider that the Office of the Governor lacks authority to retain private impeachment counsel and that those private attorneys who purport to represent the Office of Governor at taxpayer expense are acting without authority under Missouri law,” Hawley wrote to Galloway, who this week called for more information in regard to the payment of those attorneys. In addition to that, Galloway has also reached out to the Office of Administration and the State Treasurer to share her concerns. Both offices are responsible for the processing and paying state expenses. “It is long established that the Governor’s office has the ability to hire counsel to represent the Governor in his official capacity. In fact, former Governor Jay Nixon previously hired private attorneys to represent him and his office. Missouri law specifically provides for statutory authority for the Governor to hire counsel (RSMo. 26.020 provides that “the governor may employ and fix the compensation of such legal…assistants as may be necessary for the efficient conduct of his office.”) This authority allowing state officers to enter into contracts for legal services has been reinforced by the Supreme Court of Missouri in Aetna Ins. Co. v. O’Malley, 343 1232 (1938). “The Attorney General is well aware that a possible impeachment implicates the institution of the office of the Governor and not just the individual. An effort by one branch of government to sit in judgment on another implicates the core of the executive branch of government. Presidents (including President Trump) and multitudes of governor’s offices, from New Jersey, Virginia, Alabama, Connecticut, South Carolina, and many others, have engaged outside counsel to assist in investigations that affect governors. The Governor’s office has the authority to hire counsel to represent the office to defend its interests in any purported impeachment. “As to the argument that the Governor’s Office counsel are ‘advancing private interests,’ the Attorney General has basic facts wrong. Counsel for the Office have entered an appearance with the committee on behalf of the Office, not the Governor personally. They have attended meetings with legislative branch officials on behalf of the Office, and they have interacted with counsel for the legislative branch by responding to informal and formal requests for documents on behalf of the Office, not the Governor personally. The arguments for due process advanced by the Governor’s counsel will affect the dignity of the office for generations to come, regardless of the individual who holds the office.